Appreciation for John le Carré is at its peak right now, especially after the hit BBC miniseries The Night Manager, and several other film adaptations of his works including Tinker Tailor Soldier Spy, The Constant Gardener and The Tailor of Panama to name but a few. 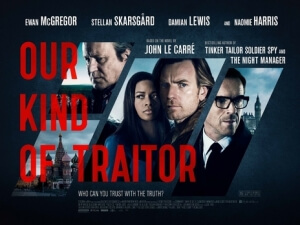 The momentum, you may be pleased to hear, continues on with the adaptation of his 2010 novel Our Kind of Traitor, on which three names behind the scenes end up outshining even the starry ensemble cast they’ve brought on board to play the on-screen parts. Susanna White directs, Hossein Amini writes, and Anthony Dod Mantle shoots the story of a British couple, lecturer Perry (Ewan McGregor) and lawyer Gail (Naomie Harris), becoming involved in the outcome of a power shift within the Russian mafia, after money launderer Dima (Stellan Skarsgård) hands them information of the dodgy dealings between the mafia and corrupt British government officials in exchange for the safety of his family, and when determined MI6 official Hector (Damien Lewis) takes them on an international covert mission to solidify the deal. The actors are all good and bring a good amount of emotion and humanity to what could have easily been a bunch of bland stock characters, with Skarsgård in particular standing out as the man who endangers his own safety for everything and everyone he loves, but it really is the behind-the-scenes trio of White, Amini and Mantle who end up elevating the material beyond just your standard John le Carré adaptation – and while this isn’t quite up to the standards of The Night Manager or even Tinker Tailor Soldier Spy, it’s still a highly thrilling movie thanks to their individual contributions. Mantle, for one, is a cinematographer who has worked with directors like Ron Howard, Lars von Trier and Danny Boyle – winning an Oscar for his work on the latter’s Slumdog Millionaire – and has over time developed a particular style that can almost instantly be traced back to him, which incorporates a not-too-excessive use of digital cinematography with particularly-placed camera angles. The last time we saw his work on the big screen was in Ron Howard’s In The Heart of the Sea, where almost every other shot seemed to be a perspective shot from several inanimate objects like the bow of a ship or an oar used to row out to sea, and in comparison to his cutting-edge work in Our Kind of Traitor it’s far more restrained here than it was there, but it’s still no less innovative and attention-grabbing without being too obnoxious. Here, the cinematography is utilised to increase the tension in certain scenes, such as saturating the colour scheme to give off an uncertain mood as people are sitting and calculating the next best course of action, and blurring out surroundings in certain shots so the focus can be honed in on one or several important pieces of information. Some of it can be over-stylised, but luckily Mantle knows how to restrain his personal vision as much as possible for it not to get in the way of the actual storytelling, and he brings to the table some astonishing and thoughtful visuals that enhance the story rather than detract from it. As a film director, White has only made three feature films, including this one – her last film was the 2010 family sequel Nanny McPhee and the Big Bang (to those snickering: grow up) – and is much more prolific in her television credits, most notably working on miniseries based on other books like Bleak House, Jane Eyre and Parade’s End. On that note, you would be forgiven for detecting a slight made-for-TV feel in White’s direction on this film, but that’s not to say it’s distractingly so; in fact, given how there’s not as much extensive story here than there was in, say, The Night Manager, there’s not really a way to adapt it for television without stretching out some of the less interesting material from le Carré’s source material, so given that the material is less thick than others it’s highly commendable on White’s front that she was able to get the most out of a theatrical adaptation in the first place, whether it’s her strong ability to direct actors or inject a suspenseful energy into certain sequences, such as an early assassination scene in the snow. When it comes to Amini, we’ve been very vocal about our appreciation for the writer in the past – not least because he very kindly did an interview with us a couple of years ago – but he is one of those writers who, even when the material he’s adapting isn’t particularly strong, does whatever he can to make it as fascinatingly entertaining and gripping as possible. His work on Our Kind of Traitor is no exception, as he brings a level of mutual understanding with the characters so that they’re not all just archetypes of clichés we’ve seen over and over, and makes even the dullest of scenarios such as negotiating contract deals and interrogations lively and enjoyable thanks to some strong dialogue that furthers the story as much as it does the characters. Amini was a smart choice for a writer to take on another writer’s work, adding his own unique style to it while also respecting the material that came before his input. It is the strength of this holy trinity that truly elevates Our Kind of Traitor into something that, while not among the very best of John le Carré adaptations, makes it a worthwhile thriller that everyone can be glad that they saw. Our Kind of Traitor is a thrilling John le Carré adaptation that benefits highly on the combined work of director Susanna White, writer Hossein Amini and cinematographer Anthony Dod Mantle, who all manage to outshine even the impressive on-screen performances of its talented cast, particularly the ever-reliable Stellan Skarsgård.